I recently dropped my Sturmanskie watch and in the process lost one of the small hands (see picture). I'd like to find a replacement. Did the crystal come off? If it didn't the hand should still be in the watch, somewhere. Maybe slipped beneath the bezel. I wouldn't run the watch until you find it. Need complete crown for a 2209 Amphibia Tonneau. I'm looking for an acrylic crystal that will fit the 1967 re-edition. If anyone knows a site, or the exact specs for the crystal, that would be a huge help. 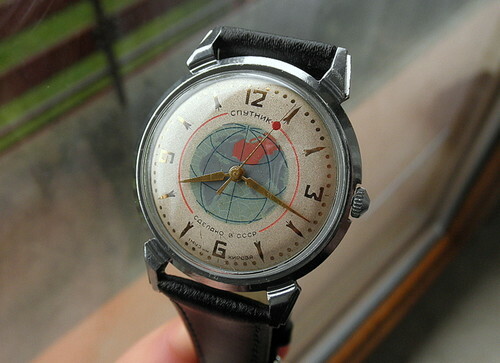 I'm looking for hour- and minute hands to the 1950's Sputnik, like in the photo below. Last edited by Lucidor; June 14th, 2012 at 14:52. Hi my friends... This is a great thread...not sure I understood how it works though. But I´ll give it a try. I need parts to a Chronograph movement: a VENUS 152.
a) A NOS dial (or in very good shape). I am not sure if the VENUS 152 caliber can share a dial with other calibers such as the 178? or a Valjoux 7736? b) a Runner wheel also known as part #8000. This has to be for the V152 to be the correct length. The V150 is similar but not as long. Thanks. I´ll post a similar watch picture below. I am looking for a mainspring assembly for a Vostok Cadet. The movement is a 2409a if I recall correctly. I wouldn't mind also buying a non-working cadet as well to salvage it for the mainspring.